I love good fries fries. I've made them with some success at home using the Steak Frites recipe originally developed by Cooks Illustrated/America's Test Kitchen. In their recipe cut potatoes are rinsed, soaked, fried at a lower temperature, then finished at a higher temperature. It did not involve blanching, and I've been convinced through research that blanching them can be helpful. In another recipe I've found for twice-cooked fries, they are merely blanched and then fried. Is this technique going to produce good fries? According to Serious Eats fries from McDonald's are both blanched and fried at a lower temperature, frozen, and then finally fried before being served to you. The French Culinary Institute has a technique that pre-blanches, blanches, freezes, and then twice fries - talk about work! From what I've read pectin is released during the blanching at certain temperatures. Also the blanching removes some external starches, which I assume rinsing and soaking may accomplish. Plus if you blanch in salted water you pre-salt the fries. My question is, what does that initial lower temperature fry do? Cook the inside? Why should I do it instead of just blanching and frying once? The accepted answer to this question says the initial fry is to cook the fries, which it seems blanching already does. It seems to have something to do with starch molecules, but I'm interested in the details. Heston Blumenthal did a master class following his research into the perfect chip. He refers to the science of how starch is released in boiling rather than blanching and makes good sense in reasoning for air drying to remove moisture. The first fry seals the outer surface and is done hot so the potato sears and seals reducing fat up take, this is good for taste crunch and health. The second fry colours and heats the fries ready to eat. These chips are one of my proudest legacies! You see them on menus up and down the country now but the original recipe came out of endless experimenting at home long before I even opened the Fat Duck. The first secret is cooking the chips until they are almost falling apart as the cracks are what makes them so crispy. The second secret is allowing the chips to steam dry then sit in the freezer for an hour to get rid of as much moisture as possible. The final secret is to cook the chips in very hot oil for a crispy, glass-like crust. I disagree with the accepted answer's premise that blanching is to keep potatoes from sticking. Both blanching and double-frying initially cook the potatoes at a lower temperature. This allows the first round of cooking to happen without crisping the outer layers. The second "fry" is usually with oil at a higher temperature, which nicely crisps the outside of the fry. If you're using a fry with the thickness of more than "shoestring" potatoes, the challenge is getting the inside cooked to a certain degree of tenderness without overcooking the outside. If you cook it long enough for the heat to penetrate to the middle, with oil at a high enough temperature to crisp the outside, you're going to end up with a darker, tougher, thicker, over-fried exterior. If you cut back the time or temperature enough to get the outside right, then you wind up with undercooked interior or greasy and soggy fries. I've done both, and I find that blanching (with a bit of baking soda in the water, as suggested by Cook's Illustrated) gives me a nice fry. The idea is to start the high temperature fry with an uncrisped/unbrowned, but partially cooked potato, with either technique. Why fry twice instead of blanch and then fry? Probably just a matter of personal preference - maybe you don't get a "wet" fry that spatters when you put it back in the oil, maybe the first frying makes less of a starchy mess for handling..... I'm not sure. I think, for practical "final product" considerations, there isn't really that much difference in how you initially cook the fries. If you Google "double-frying vs blanching french fries" you'll even see a lot of articles about double frying where they refer to the initial frying step as "blanching." To circle back to the main thrust of the question - if you blanch, then frying once is fine. There's no need to both blanch and double-fry. When you cook it twice, the fries will absorbe fat less the second time. The blanche process actually, and quite importantly, leads to a fry that has a fluffy center and crispy exterior. It is the superior method. Blanche, then fry. A restaurant I worked at made the best wedges I've ever had (executionally) blanched (in plenty of salt until almost fully cooked), cooled in the fridge, then par fried (golden), so that at service they needed less cook time in the fryer. French cuisine teaches blanche, fry at a low temp then flash fry again at a higher temp for crispy skin. The double fry however does lead to a crisp exterior, but isn't necessarily something that couldn't be achieved by frying it for a longer period of time, one time. I boil them and fry them once at very high heat. This does the trick. I tried even double frying, but didnt notice much of a difference. Actually what I did notic, is that boiling them would roughen up the surface, thus creating more crispyness. Also spices added after would stick better. Not the answer you're looking for? Browse other questions tagged deep-frying french-fries or ask your own question. Should french fries be fried two times? Is it possible to make french fries out of potatoes and tomatoes? Does frying in canola instead of shortening change the fry time? 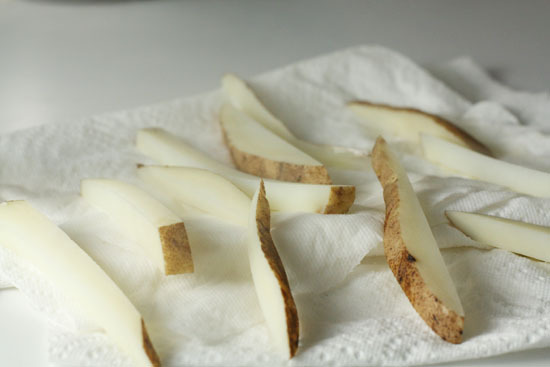 When making french fries, can I precut them before baking or frying them? How to keep cooked French fries (for French fry dogs) warm and crispy? How to avoid the potatoes from sticking to the pan while frying for french fries/finger chips?